What to do when your AIRE won't connect to your Android phone's Bluetooth. • AIRE requires Bluetooth Low Energy (LE) to connect to your phone. Please make sure you're using a device that includes Bluetooth LE. • Please ensure location services are turned on, and that you have allowed the FoodMarble app to access it. This is required for Bluetooth LE to scan for external devices. To check if you've allowed the FoodMarble app to access location services, navigate to your phone's settings. In the settings, tap "Apps" then find the FoodMarble app on the list and tap it. Scroll until you see "Permissions". If you don't see "location" on the list, tap "Permissions". This will bring you to a list where you can flip a slider to give FoodMarble location permission. • Ensure your phone's Bluetooth is turned on. If it is, try turning Bluetooth off and then on again. On Android, this can be done by swiping downward from the top of your screen. This will reveal a menu, where you can tap the Bluetooth icon to turn it off and on. 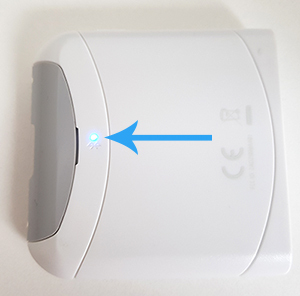 Bluetooth is activated when the symbol is highlighted. • Only pair your AIRE from within the FoodMarble app. Please don't try to pair AIRE to your phone through your phone's settings, as this can cause issues. If you've done this, please unpair AIRE from your Bluetooth. On Android, you can do this by navigating to your phone's settings, then tapping Connections. In connections, tap on Bluetooth. Locate your AIRE on the list, then tap the gear icon to the right of it and select "unpair". • Ensure your AIRE and phone are well charged. Sometimes low battery can interfere with Bluetooth performance. Please charge your phone and AIRE. When you plug AIRE in the light next to the power button will be red. Once it's fully charged, this light will turn green. With Bluetooth activated, press the silver power button on the side of your AIRE. A blue light should start flashing on the bottom of your device. While AIRE is warming up, tap on the central + menu at the bottom of the screen. Then select "Breath". The app will automatically attempt to pair with your device. If the pairing fails, select "Try again". If that also fails, tap "Choose device". This will bring up a list of any nearby devices that are powered on. Select your device from the list to pair. If your device doesn't appear on the list, ensure your device is powered on, then select the three dots at the top right of the screen and select "scan". If you have access to a second phone, please try to pair AIRE to it. This will provide more information about whether the issues is arising from AIRE or the phone. If none of these strategies have worked for you, please email us at help@foodmarble.com for further support.